Home » Community » Dine 'n' Dish » The official blog recipe review (to be updated)! The official blog recipe review (to be updated)! Mexican chocolate snickerdoodles - I really liked these! The dough came together super fast and it wasn't sticky or hard to work with. These cookies have the perfect chewy consistency!! I thought this was good. It was easy to make too. I have been looking for a barbecue sauce that did not requrie ketchup. This sauce was really good and easy to make. It will be my go to BBQ sauce. The best black bean burger I have ever had. It was not heavy or crumbly. The flavor was just right. It is fast and easy to prepare and made enough for leftovers for me. You all add more blogs, too!!! I halved this recipe and it still made heaps. It was a really nice comforting soup, though not the most flavoursome. I'm planning on making it again, and will probably play around with some spices to give it a little more 'bite'. oooh boy these are a definite keeper. I am borderline obsessed with crumpets though... Again, I made a half batch because even I don't need to eat that many. I just mixed them by hand with a wooden spoon rather than in a stand mixer, and didn't have any problems. I probably had to add an extra 1/3-1/2 cup of water to get the consistency right, and I don't have 'crumpet rings' so I just poured the batter into the pan on it's own, and other than being slightly funky shaped , they were fine. The second time I made these I lowered the heat even more, and cooked them for an extra minute or two, till all the 'bubbles' had cooked on the top, so that they were ready to pop in the toaster, because if you use the stated method of flipping them, you'll end up losing the bubble texture from the top and they don't absorb your spreads so well. I've only made this once, and was never a fan of 'regular' alfredo as I have always hated cream, so it's one of those recipes where I judge success more on my husband's reaction, as he does eat/love the creamy fatty stuff. Ridiculously simple, and the end result went down well with the whole family, including the sceptical-of-tofu-sneaking-onto-my-plate parents. For once I wanted to cook more food than vegan dad, so I doubled this mix. They were fairly straightforward in the method, but still really quite time consuming, though I did get better/faster as I went along. I didn't use peas, because I have a strong dislike for cooked peas, so my filling was just onion/garlic/spices and it was reeeeeaaallly nice. Or so I'm told. I actually took these to an omnivorous party, and didn't even think to try one myself : ( Next time I put this much effort into party snacks, I'll definitely remember to have a taste! mmmmmmmmmm. I'm definitely a firm believer of homemade-anything is better than shop-bought-everything so I was bound to love this. I crushed the seeds in my trusty coffee-grinder-turned-spice-mill because that's how I roll, and left out the jalapenos so that I could share it with the non-spice-loving family. My first mac and cheeze experience. To be honest, I was never a fan of/certainly don't 'miss' real cheese sauce. But seeing the amount of internet love for the vegan variations, I gave this a shot, and we really really liked it. My omnivorous husband loves it, and frequently requests it. My only departure from the recipe as written was to omit the miso, only because I never have any. My husband calls this vegan super food, and I might tend to agree. We've done it just poured over/stirred through pasta, and baked in the oven with breadcrumbs on top, and it's good either way. Now these are definitely my first and so far only experience with pumpkin in a sweet recipe. Buuuuut we really really really like them. I've made them for a work pot-luck dinner, for dessert when having friends round for dinner, and for family gatherings, and no-one is yet to not love these rolls. The recipe is for 12, and I've done them that size, but I also like to make them much smaller, so you get more like between 2 dozen and 30 from a batch. Then, if I feel like indulging, I don't have to feel quite so bad about all that margarine and sugar! Still, they're damn fine. I've made my own 'cheezymite' scrolls with marmite and nutritional yeast... but that's probably only of interest to the down-under vegwebbers. Good way to use up leftovers, if, like me, you like anything and everything spread on pizza. I made this without the seitan because we were having it with the crispy cajun chickpea cakes. Otherwise, made it following the recipe. It was fairly quick to put together, and made a nice change from the indian/thai/chinese/italian food rotation we normally fall into. I'll definitely make this again. Like the title says, this is a super quick sauce, pretty healthy, and easy to make with things that always live in my cupboards. It's nothing ground-breaking, but it is tasty, and easy enough to shake up the spices/herbs and customise it how you like. I've made this cake a few times, and it's really good, though my crumb topping is definitely much more crumbly than I think it should be. Possibly because I used a mix of white/brown sugar rather than molasses? I also tend to err on the light side when adding margarine/oil, so that could be it. Either way, it bakes up really well, and doesn't fall off/fall apart so I'm happy. For something different, I've also made this with a filling by soaking dried apricots and blending them into a paste, spreading over the base and topping with the crumbs. You could do this with any fruit, or even a chocolate/caramel sauce... makes a nice contrast with the fairly plain cake. I've made this baked risotto, but not the balsamic reduction she recommends to go with it. It's a fairly straight forward risotto recipe, but an interesting method, because it saves you standing at the stove stirring. I was sceptical of how well it was going to cook, and kept checking the oven to see whether it was drying out, but it was the opposite. I think I had to leave it in an extra 10-ish minutes, but in the end the rice was beatifully done, and the flavours had come together nicely. It's probably just me being a bit traditional about liking standing at the stove stirring, but I don't think I'll use this method again. holy moley this suckers are goooood. I've lost track of how many times I've made them, and I've never had leftovers yet. They also work fine with regular flour when you don't have any durum atta. Also, I've learnt to make more potato filling than necessary, because both my husband and I struggle to not just eat it with a spoon, it's so freaking tasty. Really tasty, easy, but fancy looking soup : ) The spicyness of the cumin and chilli gives this soup a lovely kick, and it's super hearty and filling with the lentils and broccoli. I made the coulis and it was tasty and looked very pretty, but I think this soup would be just yum on it's own with some homemade bread. I'll probably only do the coulis again if serving it to guests. These are delicious. I used whole wheat flour and substituted dried cranberries and pecans for the raisins and walnuts. My husband said they were the best cookies he's ever had in his life. The second time I made them, I put a little ginger in, too. The Banana Oatmeal Cookies on the Shmooed Food (Vegan Lunchbox) website might me the easiest cookies in the planet to bake. After a chocolate chip cookie week, I needed a lighter treat that didn't give me a surging sugar rush. The Banana Oatmeal Cookies did the job. This wheat-free, sugar-free, oil-free cookie combines oat flour, pureed bananas, cinnamon, dates and sunflower seeds to make small pillowy cookies. More like a muffintop then a cookie. I replaced the dates with raisins, left out the sunflower seeds because I didn't have any. Next time I think I will throw in some walnuts and maybe a half cup of quick oats, not oat flour, to add a little more texture. Baking them bigger, they could make a grab and go breakfast cookie too. I halved the recipe, so I could easily bake them in my smaller toaster oven. Half the pleasure in baking these is the warm banana scent wafting through the kitchen while the cookies are baking. 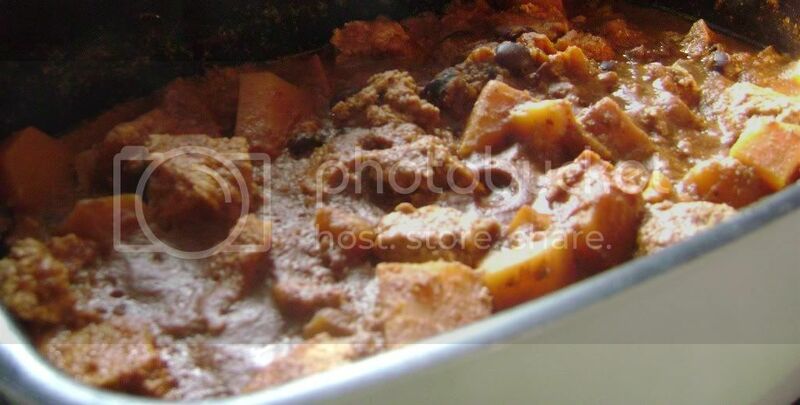 Tofu, Tempeh, and Butternut Squash in Slow-Cooked Peanut Mole: This stuff is SO good! The allspice/clove/cinnamon flavors are weird at first but, WOW, it becomes a party in your mouth very quickly. I omitted the tempeh and put a cup of black beans in there instead. For the spices I used the already ground ones, and I went with using regular chunky peanut butter instead of peanuts or natural butter. I also used a whole can of Mexican diced tomatoes. It didn't need the entire amount of broth either. The only thing that got kind of lost in there flavor-wise was the squash. I think sweet potato would work equally well or better. This is a make-again recipe! Yes! Please keep adding here during/after the challenge. I love this one. My husband made Eggplant Creole from Fat Free Vegan for me tonight! : It turned out to be quite good but we ended up adding more of the garlic/herbs/spices and I even added a little bit of vegan Worcestershire sauce. Very good over brown rice! I made another Vegan Dad blog recipe last night - the Crispy Cajun Cakes: These turned out rather bland to me, even with my small additions of garlic and Cajun seasoning and kelp powder. The cakes were quite crumbly too. They need more spices and moisture for them to be better. I made a half-recipe of Vegan Dad's Hickory Smoked Veggie Turkey Lunchmeat. I didn't have any Bragg's so I left it out. I wish I had, at least, subbed more soy sauce for it, because it turned out extremely bland. The texture is fine, and it slices well; so I could definitely work on the flavoring. I'm thinking about how I could work Quintess's Chicky Baby Seasoning into it. The other day I made My Veggie Kitchen's Seitan Clams in Kombu Broth. Well, mostly made it because I made some changes out of necessity: The end product was pretty good and really "clammy" according to my seafood-loving husband. The texture was a tad tough and chewy but it did have a nice sea flavor. I ended up baking them for a little bit in some of the broth after they were done boiling in the broth. Later on I fried them with an egg replacer and cornstarch (plus salt and pepper) breading. If I make them again I think I would change the breading and only fry or bake them instead of both (this works well for me with other seitan foods but it didn't work for these clams). For the mods I did: I used wakame and some kelp powder instead of kombu, ground black pepper instead of peppercorns, and I added a bit more garlic to the broth. He didn't indicate how much water to use so I started out with 2 cups and added more as needed. The Breakfast Sausages from Vegan Dad's blog: Pretty good, especially after frying and dipping in maple syrup. I think the spices could have been upped or changed somehow to give them more umph. The texture turned out well, not bready or doughy or too chewy - I think steaming them for a bit longer than suggested helped that. I used great northern beans instead of white kidney, but that was the only ingredient change I made. J really likes them, though he agrees about the spices so I'll probably make them again, experimenting with that.